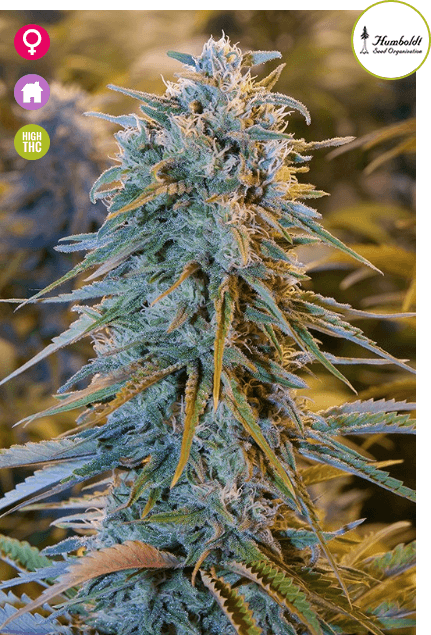 Home Marijuana Seeds Blue Dream marijuana strain review! Learn all about the Blue Dream strain! Blue Dream marijuana (a.k.a Blueberry Haze) is loved worldwide by both connoisseurs and those only venturing into the world of cannabis. It is especially popular in the USA. Blue Dream marijuana is a sativa-dominant hybrid strain, developed by crossing the Blueberry and Haze marijuana strains. The Blue Dream strain is very dreamy indeed. It has superbly pleasant effects that range from feeling laid back and euphoric, to motivated and energized. The strain’s name comes from the fact that its aroma resembles that of biting into fresh blueberries. Blue Dream marijuana is versatile and appeals to diverse tastes and needs. It is nicknamed the “medical cabinet essential” as it is beneficial for a number of medical conditions. Let yourself be lulled into a gentle, calm and euphoric daytime high by Blue Dream marijuana. The Blue Dream strain originated in California. It is a predominantly sativa hybrid that relaxes and energizes simultaneously. The sativa/indica ratio is between 60/40 and 80/20 and derives proportionately from the parent strains, Haze (sativa) are Blueberry (indica). Blue Dream marijuana has the soothing fruity aroma of blueberries, but packs a mean punch. High THC levels of between 21-25% ensure that Blue Dream marijuana produces a heavy sedating effect, while providing medicinal relief from depression, pain, nausea and the like. The Blue Dream strain has CDB levels of approximately 2%. 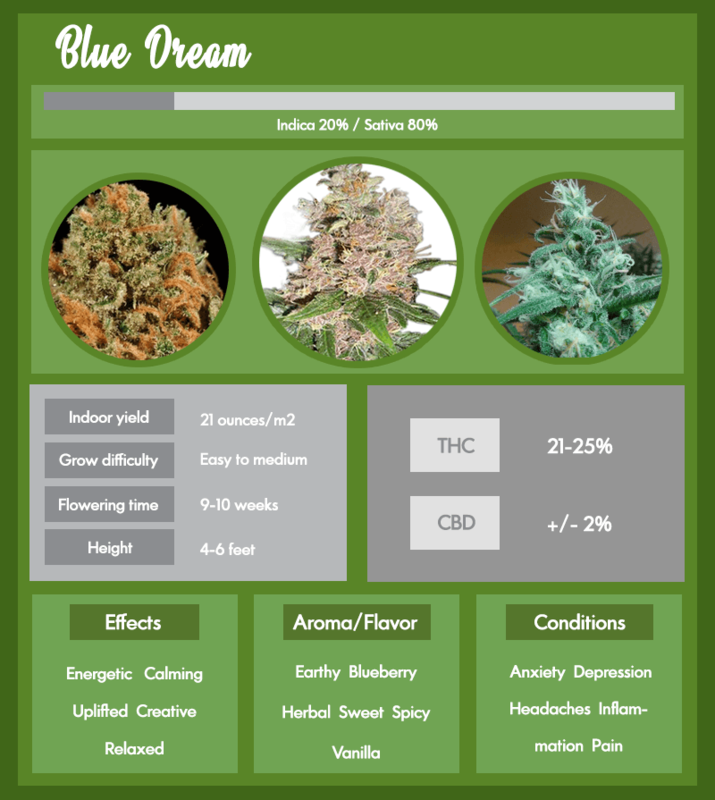 Here’s an infographic that gives you a nice overview of the Blue Dream strain. The Blue Dream strain does fairly well outdoors, so long as there are not extreme climate fluctuations. Subtropical or Mediterranean climates are best when growing the Blue Dream strain outdoors. Blue Dream marijuana has a sweet, fruity aroma that tends to attract parasites, like the red spider mite. This makes it prone to infestations, if temperatures are not ideal. Temperatures should range between 65 and 85 degrees F.
Blue Dream marijuana is best suited to indoor growing where you can completely control the environment and keep parasites at bay. The Blue Dream strain is relatively easy to grow indoors. Blue Dream seeds take 9-10 weeks to flower. This is pretty average compared to other marijuana strains. The expected yield for Blue Dream marijuana grown indoors is about about 21 ounces per square meter. The Blue Dream strain originated in California and produces a cool vibe to match its origins. Blue Dream marijuana produces a high that makes you feel relaxed and easy-going, much in the same way as its birthplace does. It is a preferred choice for a daytime high, when you don’t want to be overwhelmed by euphoria. The Blue Dream strain was created in around 2003 in Santa Cruz, California. Rumor has it that it was created in a medical marijuana lab, but there is no proof of this. The parent marijuana strains are Blueberry (indica) and Haze (sativa), and its more remote ancestry includes the Afghani, Thai, and Mexican strains. The Blue Dream strain has notable effects that make it extremely popular. It is legendary among the California medical dispensary set. This sativa-dominant hybrid, produces a noticeable high, without a heavy euphoria. Blue Dream marijuana gives you energy and calms you at the same time, making it an ideal daytime strain for those who live busy lives. Blue Dream marijuana is versatile and a “best in class” choice for many. Its genetics are clean and the effects are constant for most people. Blue Dream leaves you motivated and uplifted, yet happy and relaxed. This wonderful laid back feeling is accompanied by a euphoria that is energizing and promotes creativity. It is know for its chilling effects that provide full-body relaxation. The Blue Dream strain is a perfect daytime choice to energize and uplift, but shouldn’t be consumed too late in the day if you are planning an early night. If you want to maximizes feel-good vibes, Blue Dream marijuana is the strain for you. Blue Dream marijuana has almost no serious side effects. The most common side effect of the Blue Dream marijuana strain is dehydration that can manifest as dry mouth, dry eyes or blurry vision. Drink plenty of water to stay hydrated. Over-the-counter eye drops can be used to moisten your eyes. A few users have reported experiencing anxiety and paranoia, but this more than likely due to overindulgence that a true side effect of the Blue Dream strain. 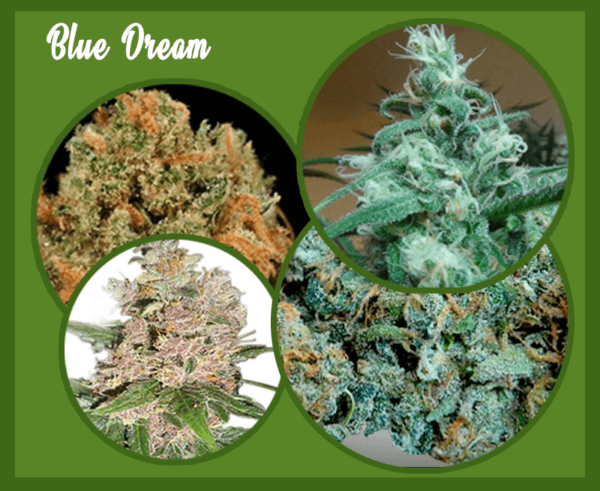 The Blue Dream strains hits the trifecta when it comes to flavor, taste and aroma – it really has it all. Its sweet and fruity smell will remind you of freshly-picked blueberries. You will also whiff traces of mango and sweet vanilla. The blueberry flavor is prominent in the Blue Dream strain, and the fruity flavor is very pleasing to the palate. The earthy taste has traces of sandalwood, citrus, and grape, and a hint of floral. Blue Dream marijuana’s aroma is pungent, and is probably not the best choice if stealth is of importance. Blue Dream marijuana doesn’t look the way it sounds – there is no blueish tint whatsoever. The buds of the Blue Dream strain are green and occasionally sage colored, with yellowy-orange pistils and a frosty coat. The Blue Dream marijuana plant’s leaves are orange-brown to dark green in color, depending on the growing conditions. The soft, warm, soothing, gentle high of Blue Dream marijuana makes it a suberb choice for many chronic medical conditions. Blue Dream marijuana is an effective pain reliever that has helped many chronic sufferers. Because the Blue Dream strain relaxes both body and mind, but keeps energy levels up, it is a godsend for managing pain and the myriad of issues related to inflammation in the body. You remain fully functional while treating your symptoms at the same time. Blue Dream has THC levels of approximately 21-25% THC, CBD levels of approximately 2% content. Louise T. United States Blue Dream I received the seeds, soaked them for 24 hours, planted them in small containers outside on 5/11 – all up on 5/17. Delivery time was good – ordered on 4/23 delivered 5/10. Only disappointed about my credit cards, although advised both Visa and Mastercard, they both declined. Sent cash through the mail. Would like to see better acceptance of cards. No advice about outdoor growing of seeds. Anonymous United States Great!!! 5 seeds 5 popped no runts no deformed sprouts, impressed! Anonymous United States New baby girls!! As expected..They arrived on time in a neutral package. Sprouted 4 seedlings from 4 seeds in honor of 4/20! Ordered 10. All seeds looked viable and healthy. No surprises. Here’s to a healthy Blue Dream grow! We hope you have found this Blue Dream marijuana review helpful. Next articleSour Diesel marijuana review! Learn all about the Sour Diesel strain!